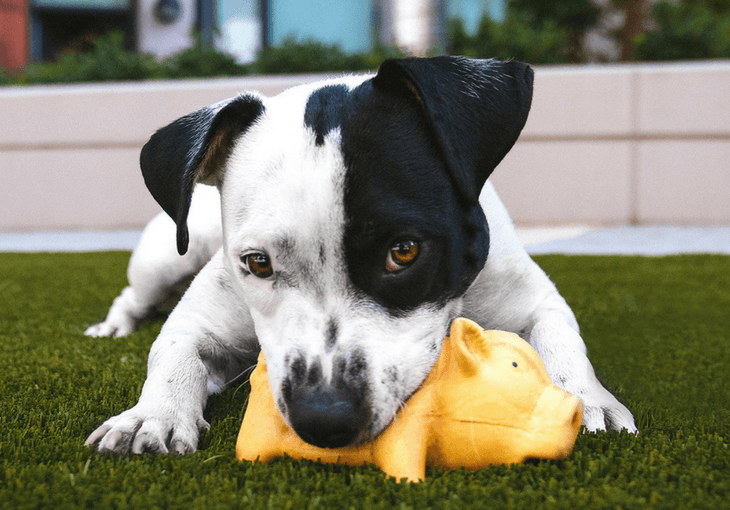 →How Much Does It REALLY Cost To Own a Dog??? How Much Does It REALLY Cost To Own a Dog??? The "Pet Ownership Costs Guide for 2017" from The Simple Dollar gives a good overview of the primary cost to own a dog. These expenses include the cost for acquisition, medical care, food, equipment, training, and grooming. Using the below "Pet Cost Calculator" in The Simple Dollar guide, let's examine the most basic expenses for dog ownership. Let's assume for a moment that you are GIVEN a puppy so there are no acquisition fees. You buy the cheapest dog food. You only buy a few toys. You get the most basic medical care (vaccines, flea protection, heart-worm prevention, ear care, and very basic dental care). You do all the dog grooming yourself (nail clippings, dog baths, hair detangling, etc). You buy the most basic equipment like a leash, harness, collar, water bowl, and a food bowl. You don't pay for any dog training. You don't put up a fence in your backyard. You don't even buy a dog crate. Under the above scenario, you would end up paying $615 for the first year of that "free" puppy you were given! And... keep in mind this is the ABSOLUTE MINIMUM COST, and certainly not very realistic for most dog people! Now, think about how much this rock bottom bare minimum cost would be over the lifetime of the dog. Let's assume you were given a "free" puppy that grows up to be a medium sized dog and she lives twelve years. The rock bottom lifetime price for this "free" dog would be about $7380! Now, let's get more realistic! Let's assume you love your dog like she is your child, your fur baby, your best friend in the world, like most dog people do. Since you care about her so much, you want her to be healthy and live as long as she can. So, instead of buying her the cheapest dog food on the market, full of allergy causing grains and cheap unhealthy fillers, you buy her a medium cost non-grain, no filler food. You tried clipping her toenails that one time but you accidentally cut into the quick and that piercing yelp she let out is still making you cringe every time you think about it. So, you decide to have her nails professionally clipped six times a year. You also buy her a crate so she can be safely transported to the vet and on various trips. So, because you love your "free" dog, the lifetime cost has already jumped from the bare minimum unrealistic price of $7380 to $12,460! And.... we're really not yet in the ballpark of what's actually realistic for the vast majority of dog people! As a person who shares her life with lovable dogs myself, when you see them romping around and having loads of fun with that brand new toy you just bought them, your heart is going to melt and you'll be off to the pet store to buy some more in no time. Just the tail wags you get when you walk in the door with a new toy is enough to keep you going back to the pet store again and again! Realistically, for most dog people, $25 a year only scratches the surface of what they'll actually pay for dog toys. Plus, don't forget the chew toys and chew treats you'll want to give your dog so you can give them a special treat just for being a "good dog" and such an important part of your life! Plus, of course, it's good for their teeth and they'll give you lots of puppy dog love in return which will just motivate you even more to open up your pocketbook! One tug-o-war variety pack of toys and a few balls from Amazon and you've already spent that $25 minimum toy budget! So, you may want to multiply that by a factor of ten! And... speaking of treats... here's a big expense that is not part of just buying them their basic food so get your wallet out! You can very easily double, triple, or even quadruple your "dog food" budget when you start adding in the treats. AND... you WILL be adding treats because that "free" dog you were given is going to worm her way into your heart in ways you never thought possible and you'll be going to the ends of the Earth to make her happy! And... then there are all the miscellaneous expenses! How about that cute Halloween costume for your dog that you just find irresistible that will set you back another $10 to $30 a year. Not to mention those reindeer antlers you buy at Christmas time to adorn your doggie's head or the funny bunny ears you buy at Easter or the "I love you" heart necklace you have your dog wear for your significant other! Christmas gifts to and from the dog, birthday gifts to and from the dog, and so on! Yes, your dog will become a gift giving and gift receiving member of the family, mark my words! How about when you take your dog on necessary walks on rainy and or cold days and you notice her shivering. You'll be shopping on Amazon that very night for a doggie raincoat and a doggie sweater! k'ching, k'ching! That's another $20-$100 a year easy! Take out your wallet again for a warm winter doggie coat! How about the anxious dog who needs one of those anti-anxiety vests that seem to work so well? Then there are dog beds and dog blankets! Invariably, your dog will tell you she doesn't like the first one you buy for her so you'll try again... and again... and again... until you find the one she snuggles down into and truly loves. You may be saying, "Not me.... she'll use the first one I buy her or she'll sleep on the floor!" Yeah right... that's before your best pal in the whole world, who greets you at the door every day with her tail wagging and gives you sloppy wet nose kisses and licks, starts looking up at you with those big puppy dog eyes and yanks on your heartstrings! Trust me, you will cave! K'ching! K'ching! K'ching! $20 - $100+ dollars at a time! Whatever makes her happy, you'l be obliging her! when she is naughty and it costs you dearly! Yep, just like kids that you love dearly, they sometimes do "bad things" that will cost you a lot of money! While you're at work, and your dear ol' dog is missing you, she noses her way into your closet, knocks down your shoe organizer, and proceeds to use your best dress shoes as chew toys! How much is that going to cost you? $50? $100? $200? More? What about when she decides to chew your computer cord? K'ching $50 - $100! Does your dog poke her head through the mini-blinds one too many times? K'ching $10-$50! How about when she pees on your favorite shirt and you can't get that pee smell out? K'ching again! How about when you stay a little too long on your errands and your lovable pooch has an accident on the carpet. You pay for three kinds of carpet cleaner but none of them work or they leave a big spot on the carpet K'ching $20-$40... and then you still lose your security deposit! $1000? $2000+? "Not me! I won't rent a place that charges an extra pet deposit!" Trust me, you'll change your tune when you become so desperate you're willing to pay any amount of pet deposit because the first ten landlords turned you down because you have a dog! And... if you own a home, that's great, you'll have no dog security deposit. How about when you travel? Most hotels and motels charge daily non-refundable pet deposits! K'ching, k'ching, k'ching, every day you're gone! Do you want to take your dog on an airplane to visit your family? Get ready to pay through the gazoo for that one, not just for the plane ticket but also for all the extra requirements that is going to cost you a small fortune! And... speaking of travel, there are going to be times, most likely plenty of times, when you can't take your dog with you on trips. The cheapest possible kennel bills are about $25 a day, often they are MUCH more, and many kennels won't take a dog who shows any signs of aggression or is too timid. Plus, many dog people prefer to hire someone to house sit with their dog so their lovable canine fur-baby can stay where she'll be most comfortable. At minimum, you've got to pay someone to come in and feed and water your dog, plus take her on walks to relieve herself and get exercise while you're gone. These types of services can easily cost $50-$100+ a day! Even if you take your dog to stay with Grandma or Aunt Sally, you'll still want to kick in some funds for the extra trouble. Now, there's another major cost that no dog person wants to even think about. You spend more than a decade with your dog and she's getting old and major health issues are beginning to rear their ugly heads! You go to the vet one day and she gives you some very bad news: either you spend $1000-$5000+ dollars for a very costly procedure (or treatment) or your dog will die soon! The vet may even offer to put your dog down if you can't afford the procedure so she doesn't suffer and you start to bawl your eyes out and your heart sinks below your knees! Unfortunately, this is a very common end of life decision for a dog person. What do many people do in this situation? They whip out their credit card, dip into their life savings, borrow money from family and friends, set up a GoFundMe page, or whatever it takes to save their dog! It's one of those heart wrenching situations where money doesn't seem to matter, whatever it takes, you may not care in that moment. Pet insurance can help here but then you've got another monthly dog charge to pay and it doesn't cover everything. What are the takeaway messages? First, even if you don't pay an adoption fee, or you don't buy a dog, there is no such thing as a "free" dog! Second, owning a dog costs a great deal more than most people realize. Even people who are exceedingly responsible, and want to make sure they can afford to properly care for a dog before getting one, are often surprised that the actual cost to own a dog in the real world. Especially after you become emotionally bonded to them (which takes all of about two days if that), is two, three, four, five, or more times more than they expected. Rarely does a dog person actually spend the minimum required for the most basic needs of a dog. Far more often than not, they spend many times over the minimum required for basic needs! Now, is it worth it to spend several thousand dollars for a dog? They are one of the most amazing creatures to walk the planet! A dog will fill your life with joy, lower your stress, and charm the socks off you on a daily basis -- just be prepared to face reality that they don't come free, nor are they cheap!